The Bulls Tuesday recorded one of their more unlikely wins, 101-92 over Phoenix Suns, coming off one of their most unsightly losses, the blowout in Sacramento when they were close to franchise lows in shooting. But even with the third game in four nights on the road against a rested team not only with five consecutive wins but which had led all but two minutes in its last four games, the Bulls led the entire game, held the high scoring Suns to their season lows in the first quarter and first half and then rode to victory with big plays down the stretch from Carlos Boozer with a team high 19 points, Joakim Noah with 14 points and 14 rebounds and Jimmy Butler and D.J. Augustin with 18 points each. There’s always a lot of talk around this Bulls team, now back at .500 at 24-24, about all the cliché intangibles of heart and commitment and spirit and fight and battling. But it takes making the plays, thwarting the other team, coming through in your own moments and gaining control of the game. The Bulls did that beautifully against a Suns team that recently blew through the Eastern Conference with four wins in five nights on the road, including in Indiana. The surprise team of the season, the 29-19 Suns were sixth in the league in scoring at 104.9 per game, almost 13 more than the Bulls and in the top 10 in overall shooting and threes. But the Bulls held the Suns to 38.8 percent and eight of 28 on threes and just 12 assists, one by Goran Dragic to go with five turnovers, with an ideally enforced game plan. The Suns push the ball constantly, a fast breaking team with numerous players to attack off the dribble. But the Bulls got back in transition with relentless discipline that carried through all game, contested shots with breathtaking regularity and frustrated the young Suns into three technical fouls with physical play that slowed the Suns full court, half court and almost whenever they tried to run a play. And the Bulls made the big plays, led by Boozer who a day before in Sacramento had asked openly for more responsibility and playing time. Thibodeau responded and Boozer made two of the bigger plays of the game, a key steal from Dragic to stop a 13-6 Suns run to open the second quarter and then the effective clincher with 1:43 left when he powered in with an inbounds pass with three seconds on the shot clock for a layup past Channing Frye and 95-89 lead. “We could never get it going,” said Suns coach Jeff Hornacek. “We could never get over the hump. Every time we had a little run something crazy happened. We were on a nice run there and Goran takes off with the break and Boozer steals it and then they throw it and hit a three. That was big momentum. Then I think we cut it back down again (91-85 with three minutes left) and Noah throws a runner that banks in. So I guess it just wasn’t meant to be. And then there was Noah, much happier and more relieved than he was a few hours earlier when he sat in his hotel room and wondered if he’d be able to play after his outburst against the officials in Sacramento. And he did culminating in that driving left handed dart, as he called it, that stunted yet another Suns chance. “Whooooooooo, that was nice,” Noah cooed when asked about the move driving left across the lane and banking in the shot. It came just after Butler had made a bigtime three for an 89-80 lead when the Suns began trapping in the backcourt. 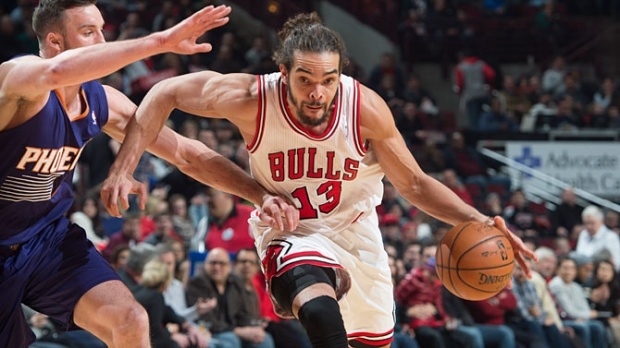 Instead of walking it up, the Bulls attacked the trap with Noah in the middle finding Butler, who didn’t hesitate to give the Bulls an 89-80 lead with 4:43 left. Thibodeau called that the other big shot of the fourth quarter along with Boozer’s. And as Butler took it, Thibodeau on the sideline went into a deep knee bend and exploded into the air as it went through. “He’s a confident cowboy,” Noah said of Butler, then calling him “Blazing Saddles” for the slick and sophisticated sheriff from the famous Mel Brooks movie. “Yeah, Blazing Saddles,” Noah said as Butler ambled away. But there was little hesitation from the Bulls this night after the uncharacteristically poor game all around in Sacramento. The Suns didn’t think so as Dunleavy perhaps symbolized how the game would go for the Bulls, drawing consecutive charges early in first quarter against Miles Plumlee and Dragic as the Bulls went on a 9-0 run for a 17-6 lead. The Bulls are at their best when they lead after the first quarter. But it was Dunleavy’s quickness in getting back, drawing the Plumlee charge even after Dunleavy’s own turnover, that demonstrated for the Bulls how this game would be different. These Bulls guys have fun, but there’s no clowning around, which enables them with really less talent than a team like the Kings to have a substantially better record. This really was one of the more unlikely wins of the season not only given the horrid performance in Sacramento but the end of the toughest stretch on this road trip after also being outplayed in New Orleans. Dunleavy perhaps symbolized how the game would go for the Bulls, drawing consecutive charges early in first quarter against Miles Plumlee and Dragic as the Bulls went on a 9-0 run for a 17-6 lead. Augustin was crucial coming off two of 11 shooting against the Kings. He was two of 10 through three quarters. But then he made three consecutive three pointers early in the fourth quarter blunting every Suns drive. He scored 11 of his 18 in the fourth quarter. Thibodeau thought some hesitation with shooting in the previous few games and misses at the line stunned the players and affected their defense. It’s often said players respond better defensively when they are making shots because it increases and enhances their enthusiasm. So Gibson said Thibodeau gave the team a little facts of basketball life at the regular meeting earlier in the day. It is one of the most important elements of building a team but also of scouting talent that often is overlooked in the hunt for a star. It’s a long season and things will go wrong; there’ll be days where the shots just won’t go or the other guy can’t miss no matter what you do. There will be controversies large and small and disappointments great and gripping. But if you have players who are responsible people, who have pride in themselves and their work, who love to compete and love to play and are determined to give all they have, then you can have success no matter whether they can sell sneakers or appear in highlight videos. The Bulls don’t get in many highlight lists. And opponents don’t much like looking at them. This Bulls team is obviously short on talent with Derrick Rose and Luol Deng gone. But they never lose their desire to compete and perform and live up to their responsibilities as professionals. The Bulls did that from the start. Taking a 21-13 lead after one quarter and 44-33 at halftime. The Suns had quarters they scored more. The Suns, though, came storming out after halftime, pushing after misses and made baskets. 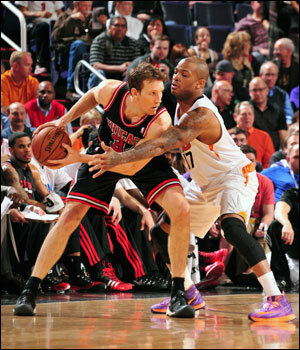 Dragic has become a wonder with his speed with the ball and the Suns got within 50-46. Their dominance seemed inevitable. But Boozer made that big steal leading to a Dunleavy three that started a 9-2 Bulls run with Boozer twice getting misses and going back up as well as attacking the basket instead of settling for jump shots. He asked to play more. But he also showed why he should. The Bulls closed the third quarter ahead 69-63 and then held off the Suns with Augustin’s threes, Noah’s rolling dart, Butler’s shooting and Boozer’s drive. “All of us were missing shots and we kind of let it affect our defense,” said Boozer, who joined the crowd in contesting well out to the perimeter, a place he doesn’t often venture defensively. “Tonight, it didn’t matter what happened. We were going to keep fighting and fighting and fighting.